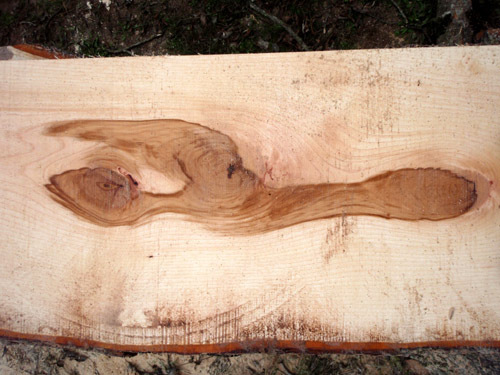 I spent an action-packed weekend milling my first tree, a mature pecan (Carya Illinoensis) that grew in the sandy soil of a nearby horse pasture. 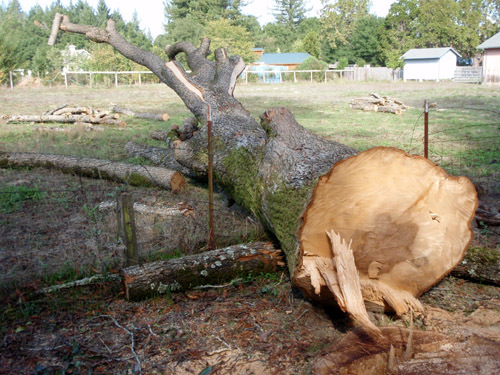 The tree was beginning to die and had been dropping large branches, threatening the safety of the horses. 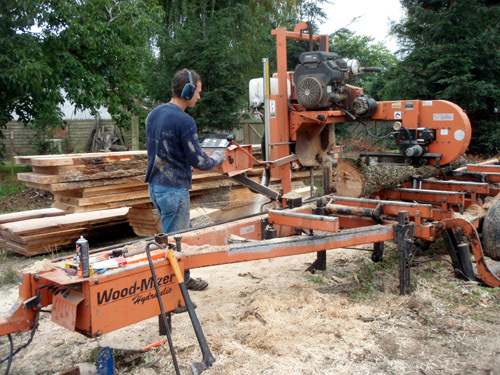 The property owner decided to take the tree down and I worked with my friend Kevin Paul, a local arborist, to devise a cutting strategy to optimize the wood for on-site milling. 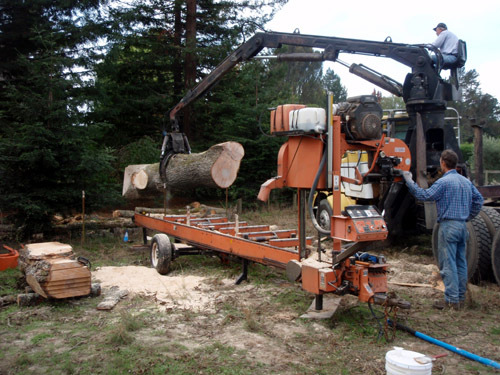 I then hired Sean Gavin’s portable mill and worked closely with Sean and a few friends milling sections of the trunk and large diameter branches to my specifications. Belonging to the hickory family, pecan is notoriously hard, even when green, and the cutting was tough on Sean’s blades. To make matters worse, we hit pockets of nails embedded in the main trunk on several occasions, probably the remains of a treehouse early in the life of the sixty year old tree. 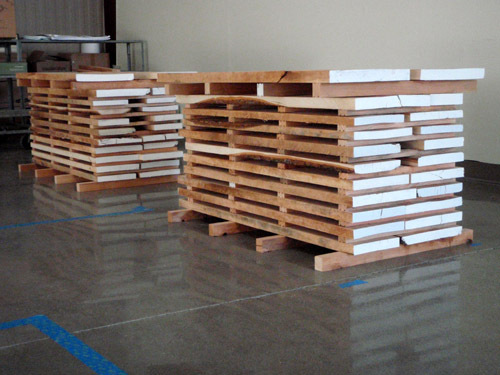 Despite the challenges we managed to mill well over one thousand board feet of wood in two short days, and I have a goodly stockpile of pecan wood ready to sticker up in the barn to dry. 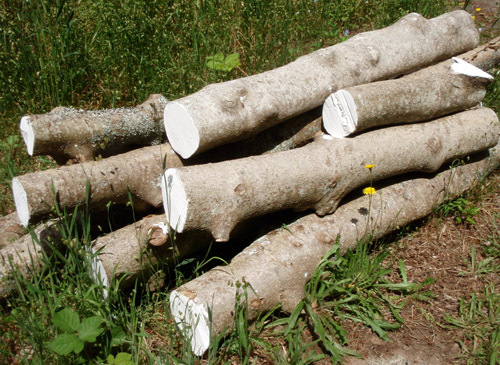 I plan to use the smaller branch stock for a project I’m developing for Shed in Healdsburg, and will save the large slabs for future experiments in furniture-making. 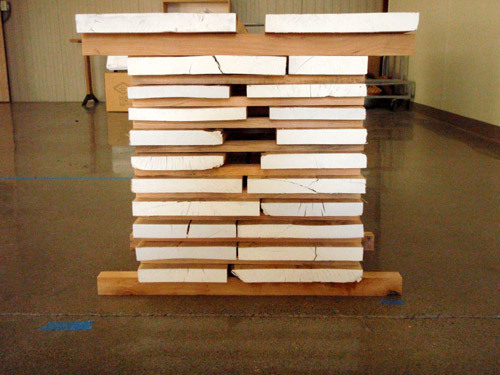 Measuring up to 16′ long and 2.5″ thick, the large slabs will take over two years to air-dry, which will give me ample time to develop a new line of tables and other furnishings that take advantage of the material’s inherent attributes. Like most hickories, pecan has a pale, creamy sapwood with streaks of honey and light brown, and a dark brown heartwood. 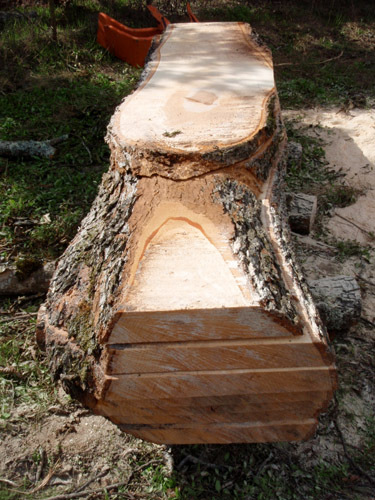 Known for its extreme hardness, strength and durability, pecan is prized for making utilitarian items like tool handles, baseball bats, crates and pallets. The process of milling and curing my own material brings me one step closer to realizing my dream of managing a true, artisan scale, craft production, optimizing the capabilities of our rural studio compound. 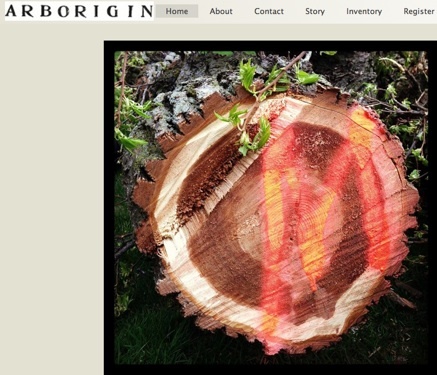 The next step will be to develop a marketing strategy to sell my wares in sync with the Deep Craft ethos. What’s most exciting to me is the challenge of reverse-engineering ‘design’ around the constraints of scale, site and local relationships, and enjoying every step of the process. 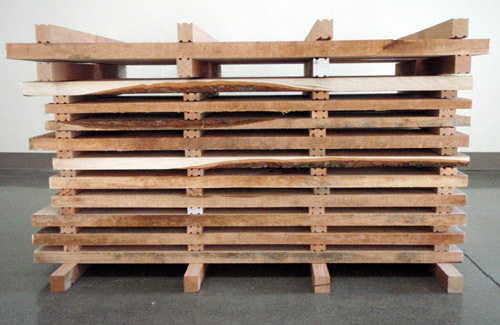 I typically paint or wax the ends of green logs/slabs to ensure a slow and even curing. I’ve begun to harvest some of the holly trees on our property in anticipation of making small bowls, spoons, candlesticks and other tableware for our inaugural Secret Dinner scheduled for this fall. The trees were probably planted about 30 years ago as an ornamental and they’ve grown to an unmanageable height, blocking light and clogging our gutters with their spiny fallen leaves. We’ll continue to make winter wreaths from branches of the remaining variegated shrubs, but I’m eager to try my hand at turning, break in an excellent set of Sheffield chisels and learn a valuable new skill. In Celtic folklore, the holly tree symbolizes protection, and it’s an ancient tradition to plant them close to dwellings to ward off evil spirits while providing food and shelter for seasonal bird migrations. A healing tea can be brewed from the leaves of certain holly trees, and it was believed that throwing a stick of holly towards bears, wolves and wildcats will ward them away. 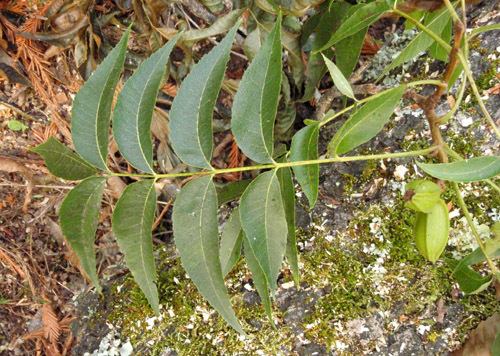 The tree has also been thought to protect people from threat of lightning and severe weather. I will consider these themes as I turn the wood over the summer for an autumnal feast featuring foraged foods from the sea. 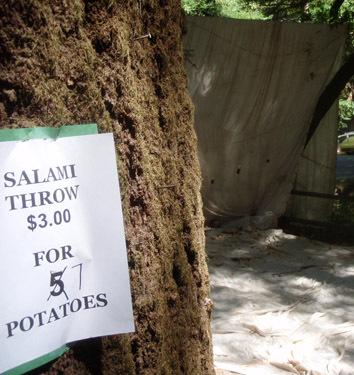 A section of the fabric from Christo’s ‘Running Fence’ (1976) is used as a backdrop for the Salami Toss at the Occidental Fire Department’s annual summer barbecue. When Christo and Jeanne-Claude realized their seminal Running Fence project in West Sonoma County in the mid-1970’s, they traded materials used to construct the 24 mile long fence with ranchers in exchange for use of the land. Learning more about the project from first-hand knowledge when our family moved to the area about three years ago, I thought it would be interesting to investigate what remains of the original materials and how they have been put to use by ranchers and others over the past 30 years. Ene and I wrote a proposal for a project we called Running Fence Revisited (click to see original proposal), for which we are still seeking funding to produce a publication. Meanwhile, I’ve begun to research and document the project on these pages and invite anyone interested in helping to participate by leaving a comment below. 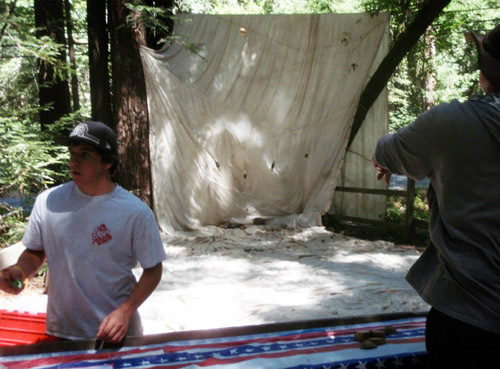 The first artifact we’ve discovered related to Christo’s original Running Fence is a section of the fabric still used by the Occidental Fire Department as a backdrop for the Salami Toss concession at their annual summer barbecue, which we attended yesterday. If you have any information about what remains of Running Fence, would like to learn more about Running Fence Revisited or help us to conduct research, please leave a comment below. Thanks! 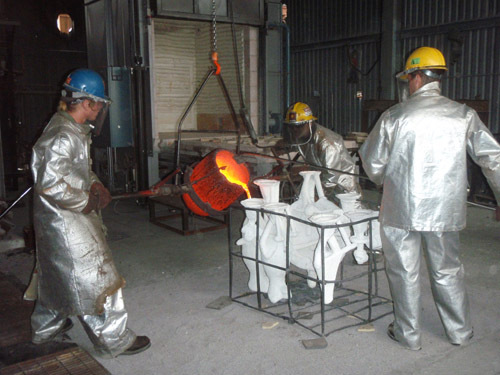 We were thrilled to witness the bronze casting of our series of sculptures for the Sunnyside Conservatory Menagerie yesterday at Berkeley’s Artworks Foundry. It has been an honor to collaborate with artisans skilled in the ancient art of lost wax casting and opens up a world of possibilities for our future public projects. While the technique is more resource intensive than any we have employed to date, it has me thinking about the trade-offs and potential rewards of purely aesthetic experiences over a longer time frame. I wonder if there is a metric to compare the impact of things designed to stimulate the public imagination against the effects of the extraction of resources that brought them into being.